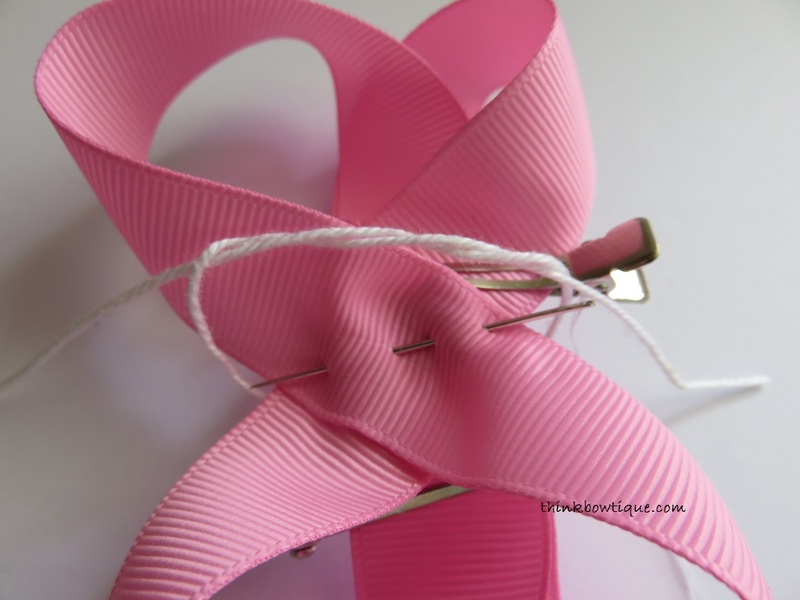 The great thing about most crafts is that there are so many ways to make the same item. 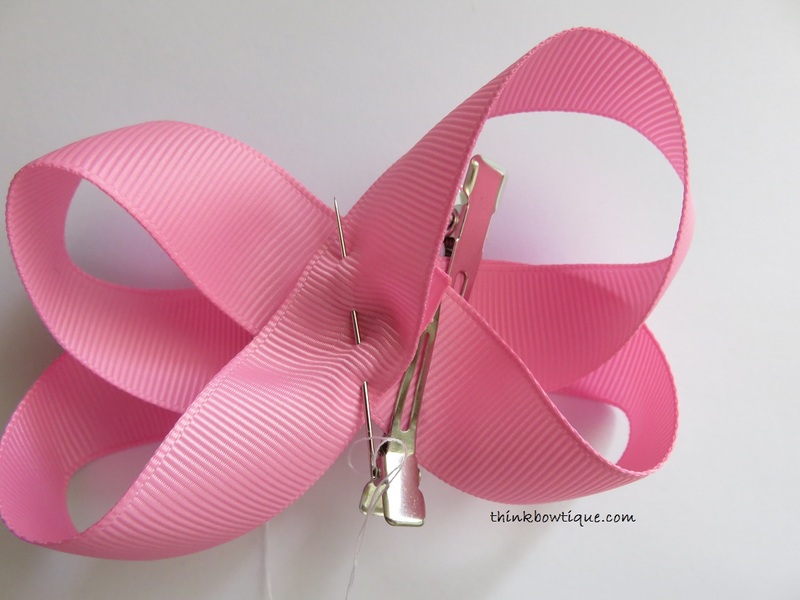 A few years ago I did a post on how to make a twisted boutique bow with 16mm grosgrain ribbon. This is the photo below. I have been playing around with the way I make this bow and have two new methods. The first was just tweaking of the first style and the second methods is completely different. Both of the two new methods give the same result. Try them both and let me know which you like best. Do you find the new methods easier to do? 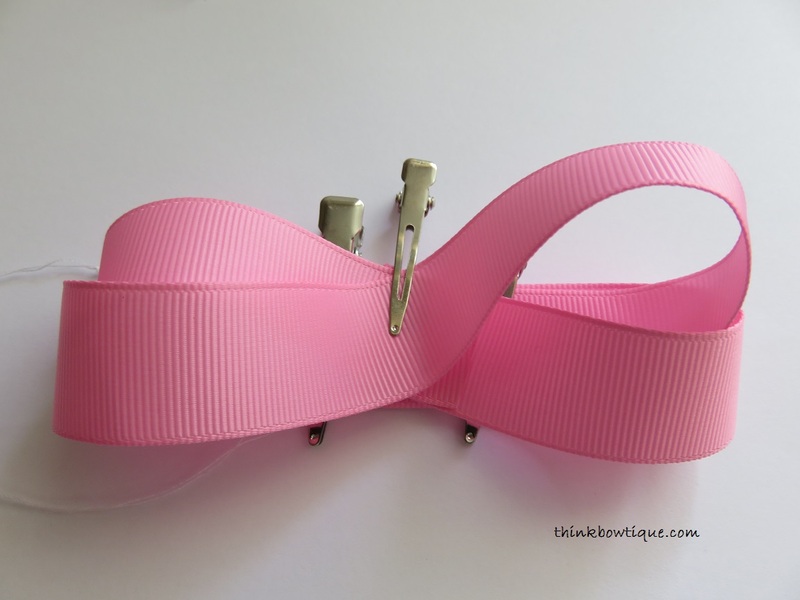 The pink bow is the latest bow. I like the new method two. Please let me know what you think. 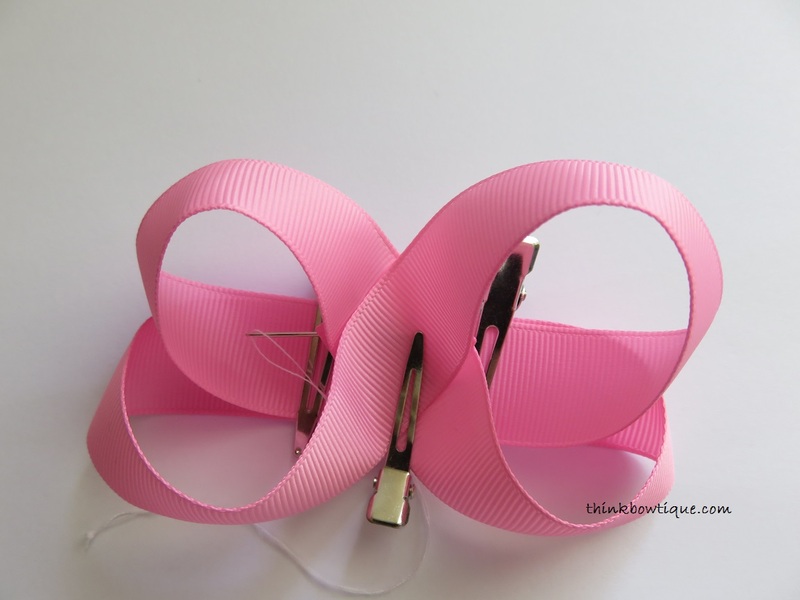 For both styles you will need one length of 22mm grosgrain ribbon 55cm long with the ends sealed. 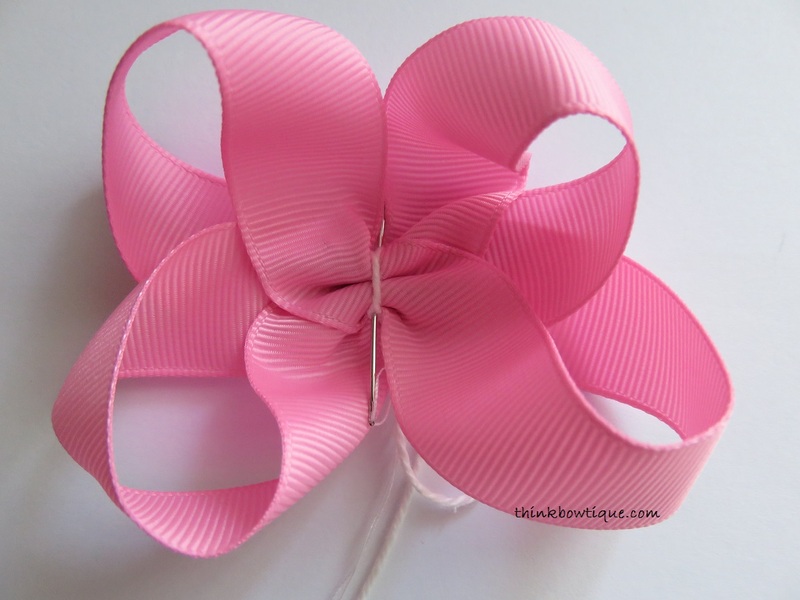 Something to tie of the centre of your bow. 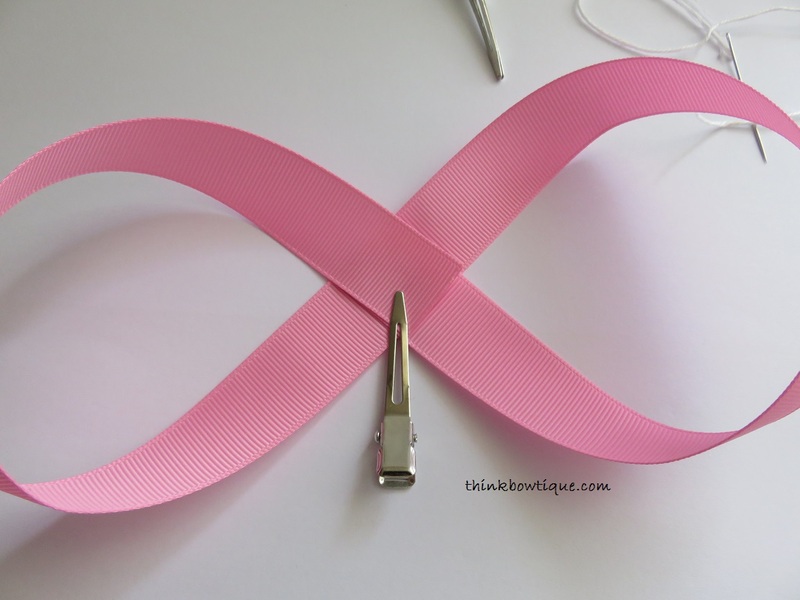 You can use crochet thread, organza ribbon, wire or even a small zip tie. Method one is tweaking the old version. 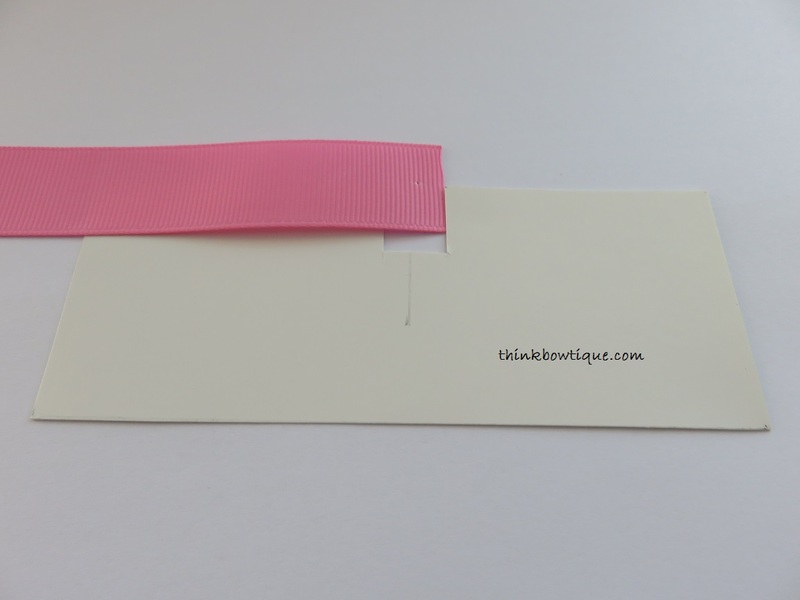 Take your length of grosgrain ribbon and fold in half crease the centre. 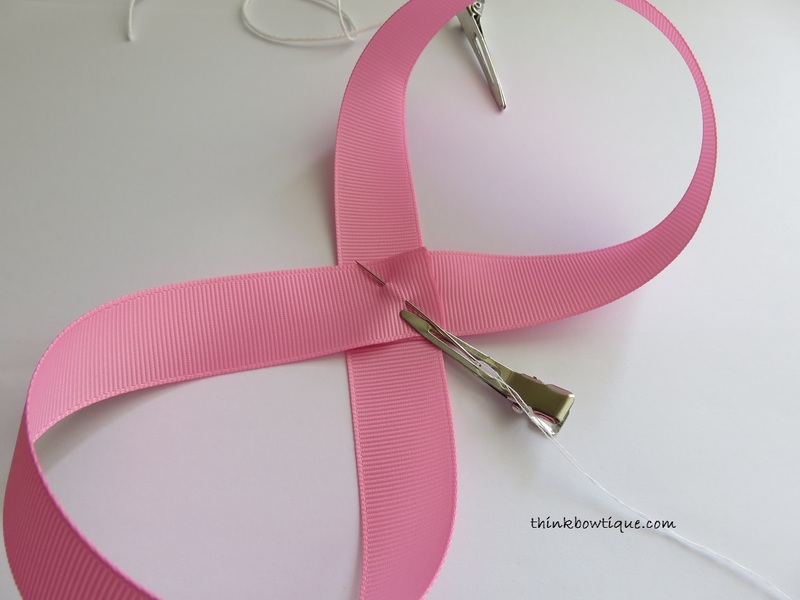 Make sure you have sealed the ends of the ribbon. I use a lighter. DO NOT let the flame touch our ribbon. Place the flame close enough to melt the ribbon ends. 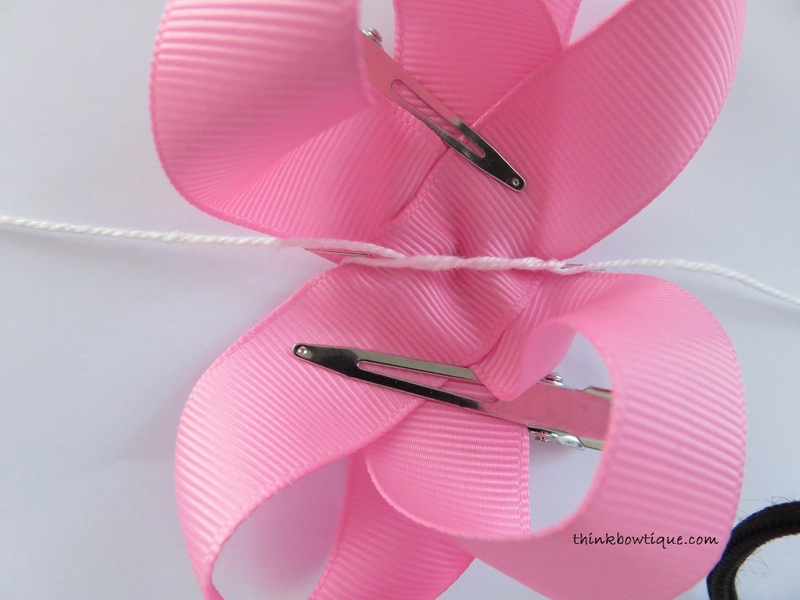 Take the end of your ribbon and bring it around to the centre of your crease line. Repeat with the other end. Put a hair clip on the edge just to hold it. 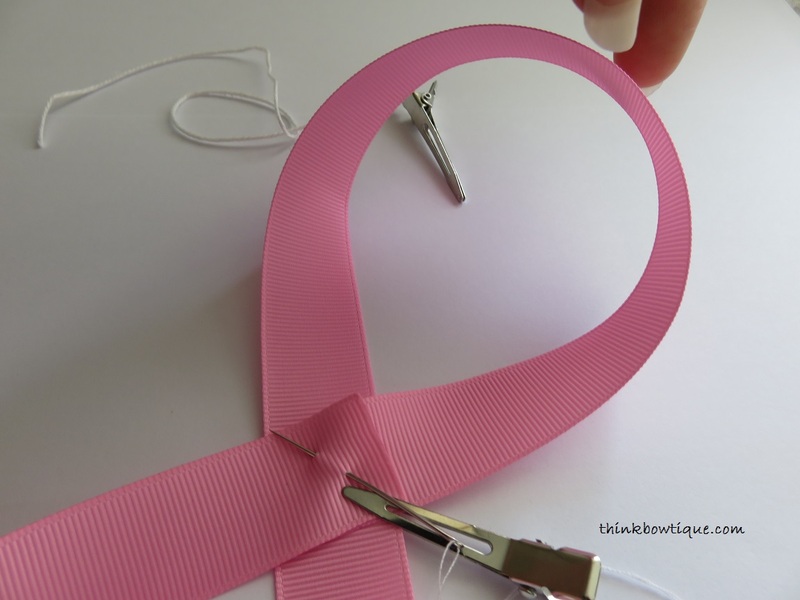 Take your needle and push it through the top two ends of ribbon. 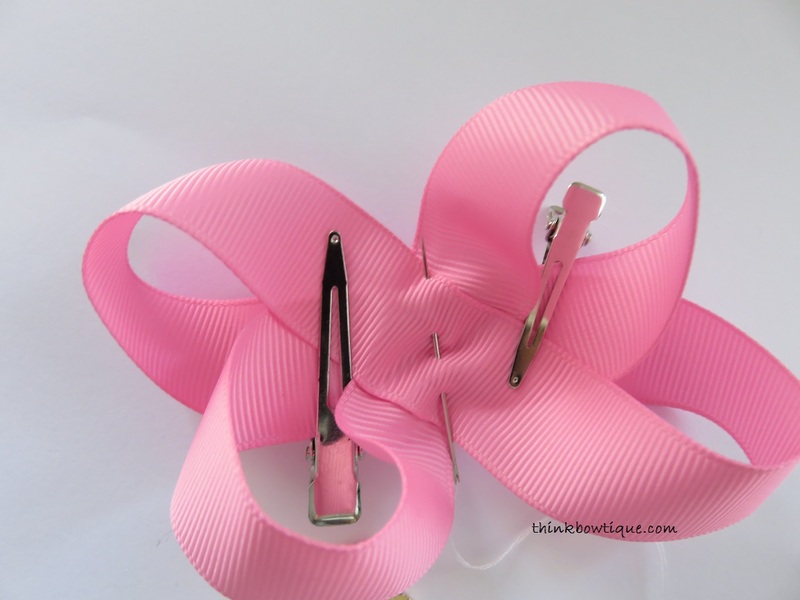 Just a little this is just to hold the ribbons together. 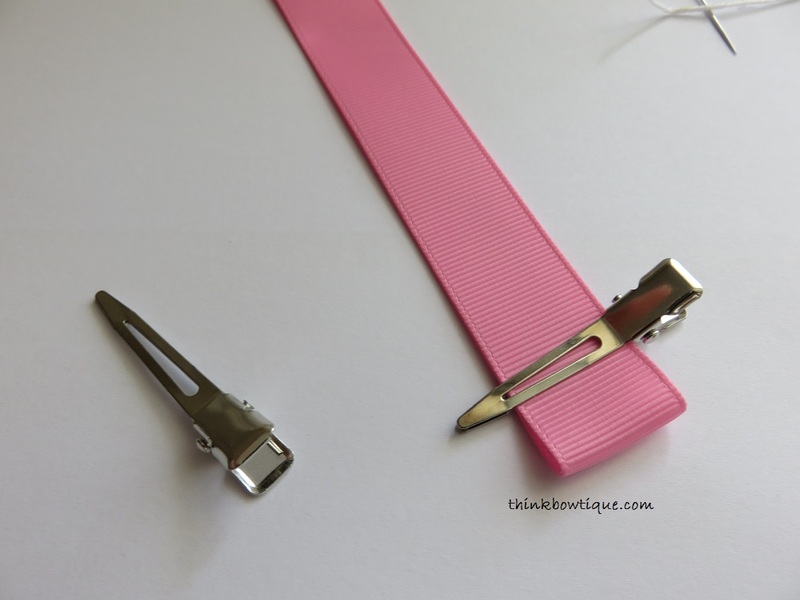 You should be able to lift up one side leaving the clip in place and slip in the needle. Take the middle of your loop. You can pull on the loop to check your centre. Do the same with the other side. Now this is where I tweaked it a little. Make sure both your straight edges are on top of each other. Not just overlapping. As you can see in the photo I placed a hair clip to the side of the centre on both sides. This is the back of your bow. Now turn your bow over to the front. Pull on each loop to open them up more. Once you have your loops in the positions you want you can pull the needle back out. Now thread your needle through creating your valley and peeks. Using your method of gathering the centre. I use crochet thread and wrap around tie a loop like you do your shoe laces. With an extra loop and pull tight. I like to place the thread on each side of my needle so it pulls evenly. 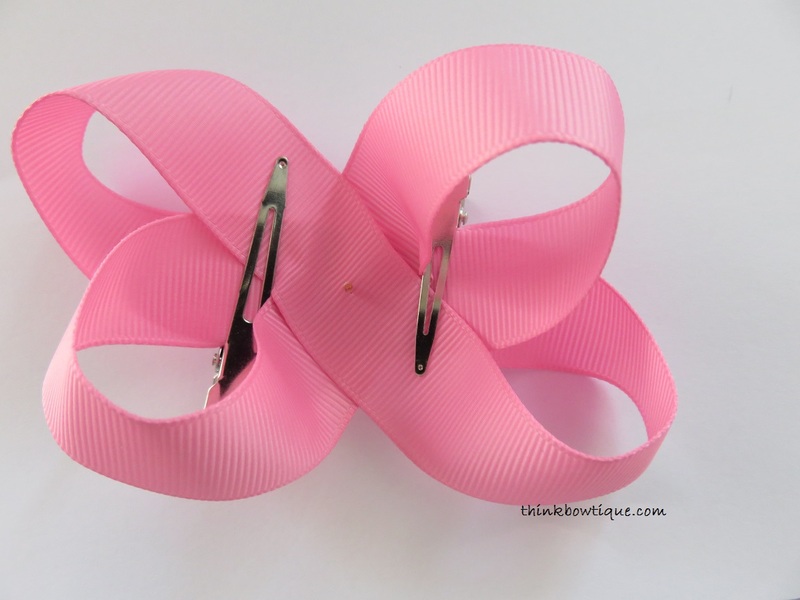 The trick to a good twisted boutique is having your ribbon with two straight at the back and the cross at the front. Now method 2 I think is a little easier and quicker. Let me know what you think. 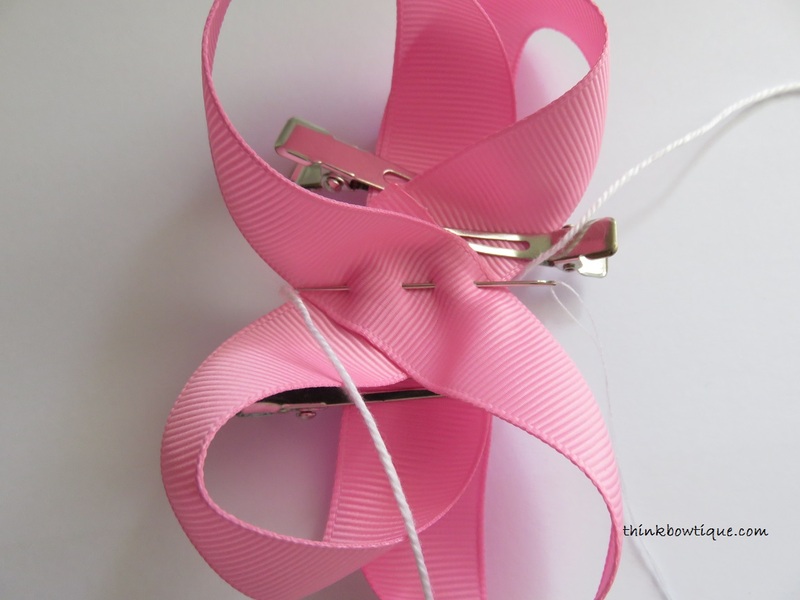 You will need to fold your grosgrain ribbon. 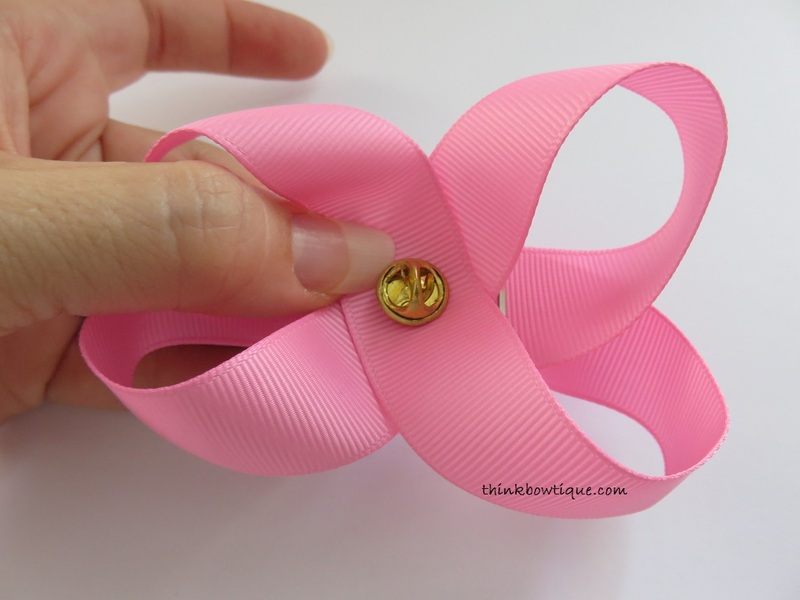 I made a template but you could just found the ribbon without it. You will also need a lapel pin. 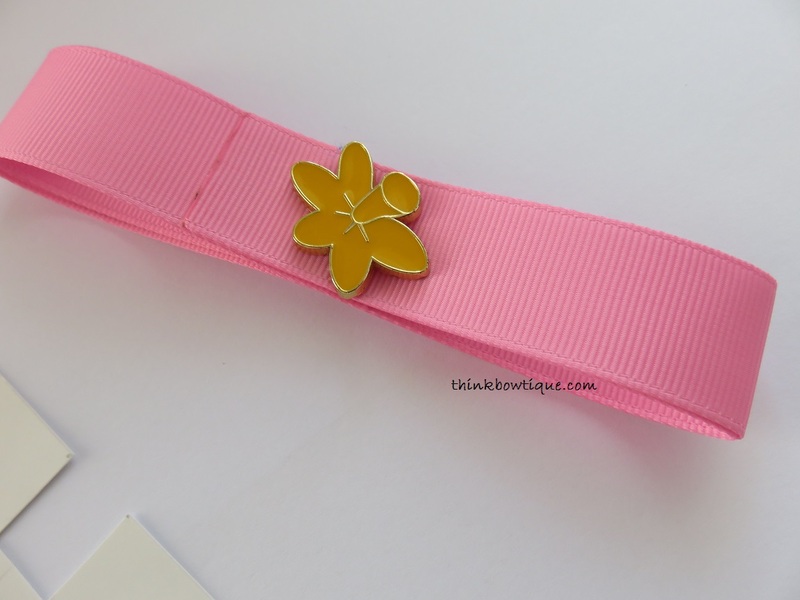 You can find charity pins for purchase in most stores. 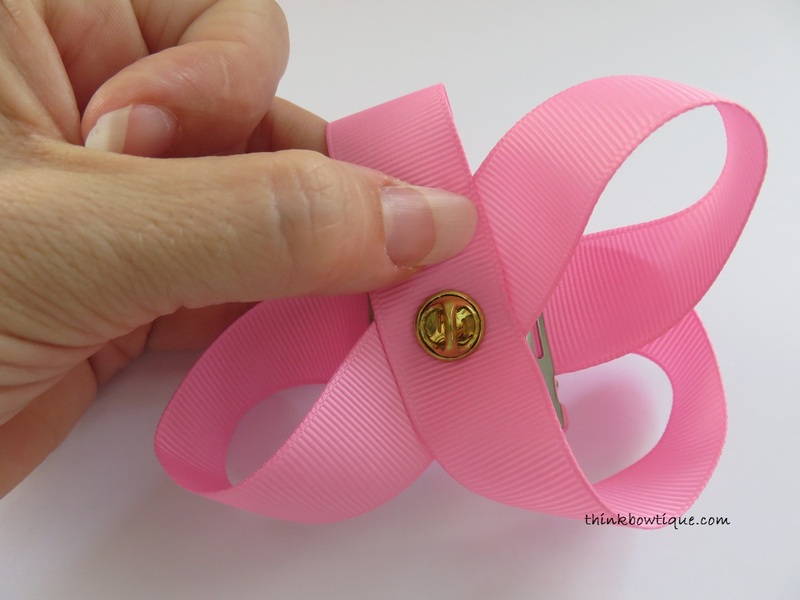 I am using a Cancer fund pin. You can see the measurements in the photo to create your template. Mark where the centre is on your template. My finished bow is about 8cm wide. 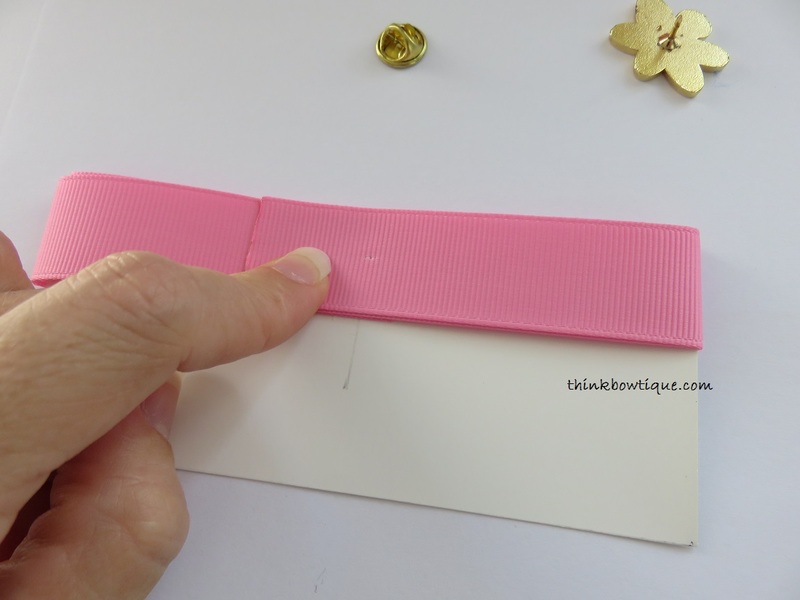 Place one end of our ribbon just passed the cut out in the centre of your template. 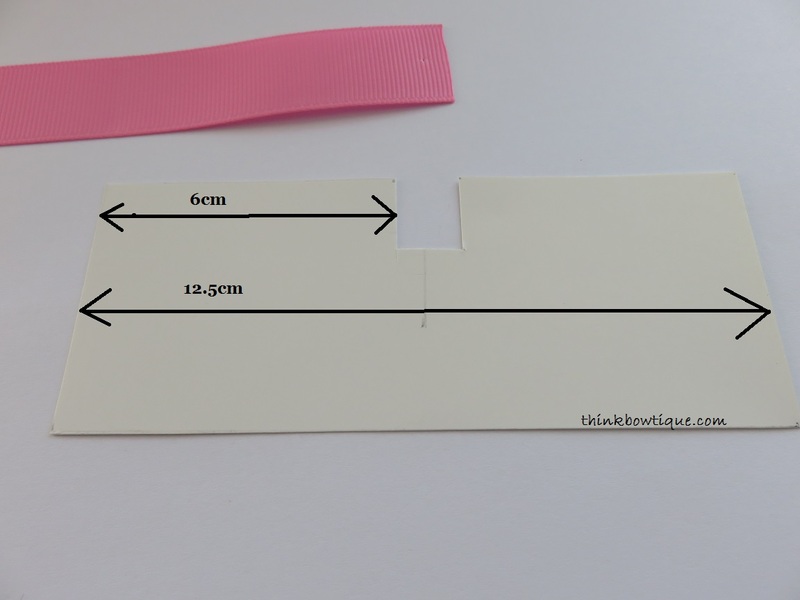 If you don’t want to make up a template measure 7cm across and fold than measure 12.5cm and fold. 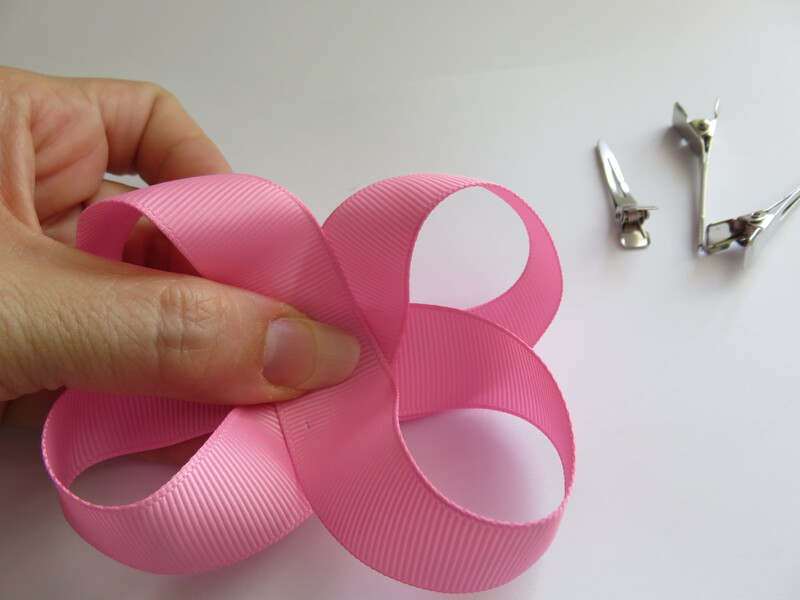 Now wrap around until the end of your 55cm ribbon. 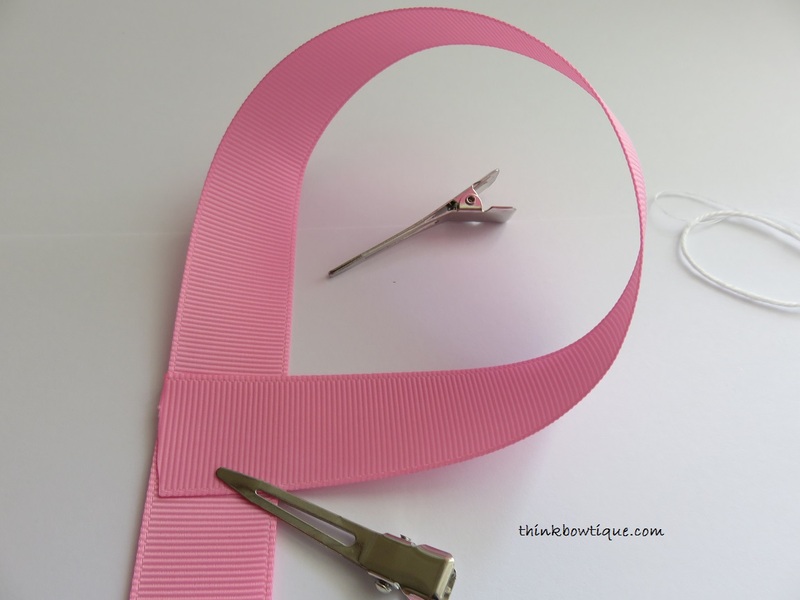 Wrap your ribbon around the template. 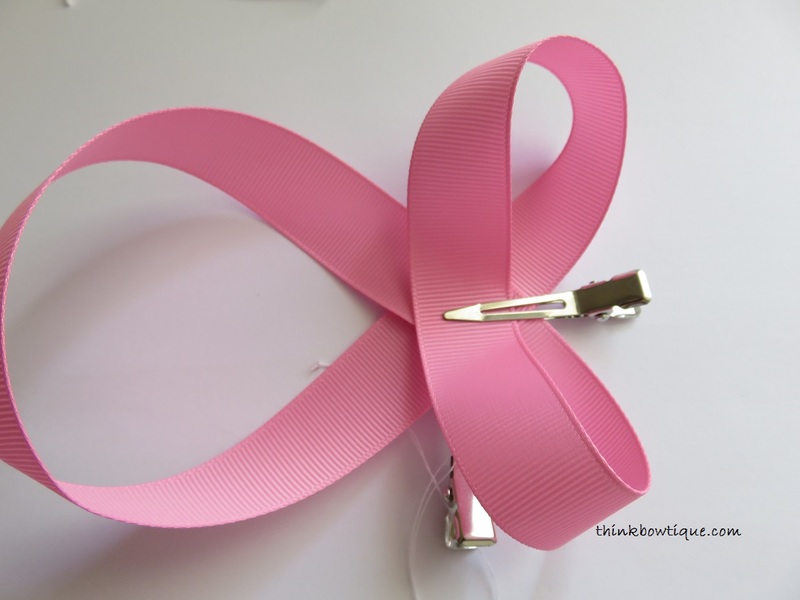 Now I found that my ribbon was a little long on this side. You can trim it but it really does not matter this will be the back. 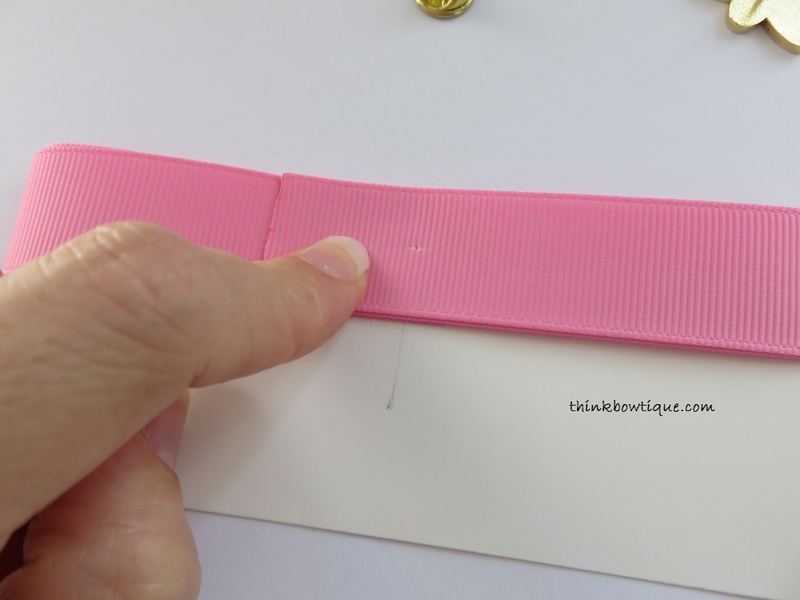 If using this method you could also shorten your length of your grosgrain ribbon a little. Or change Now unclip your lapel pin and push the needle through the centre. You can see I marked the centre on the template. 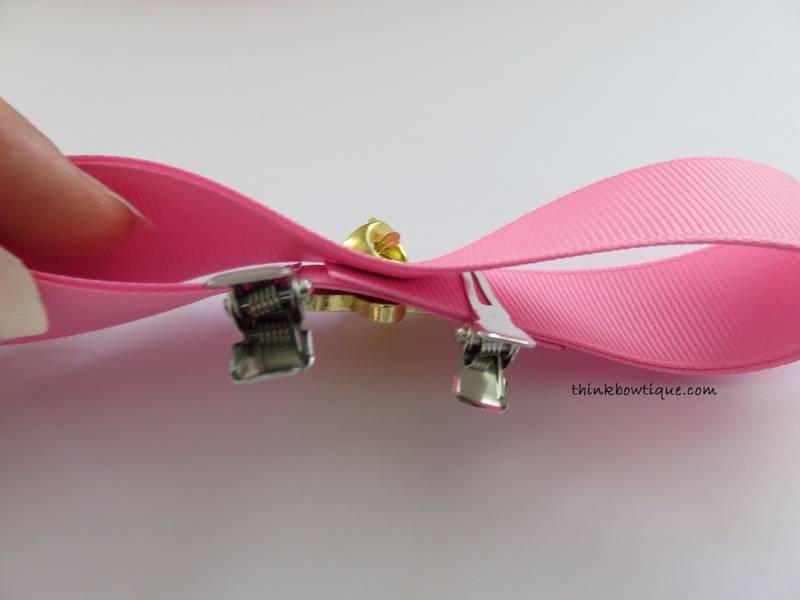 Clip the back of the lapel pin on and slide your ribbon off your template. 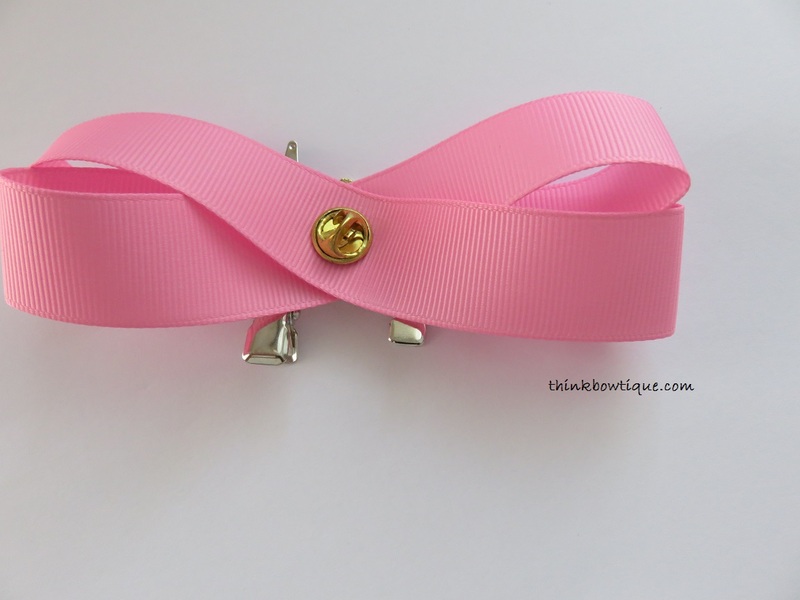 The front of the lapel pin is the back of your bow. 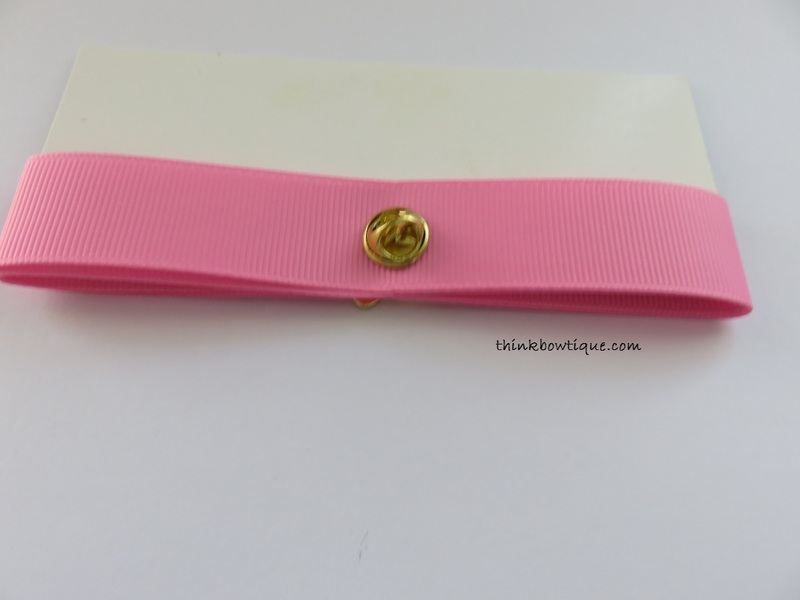 Take two alligator hair clips and clip the to the two bottom ribbons. Now Instead of clipping both clips on the same side as I did in this photo. Place the clips on opposite sides. You will see why soon. Now turn your bow over to the front. Pull on your loops so they open out and create your cross. Now here is why it is easier to have your clips on opposite sides. 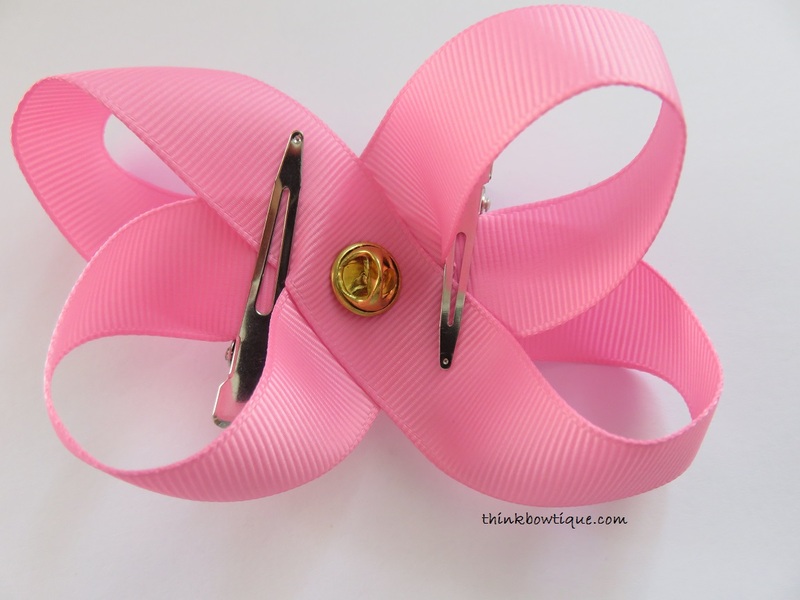 Open your clip and clip the top ribbon to hold in place. Now pop the back off your lapel pin and leave the pin in for a moment. Take your threaded needle and push through in a straight line to create your valley and peeks. 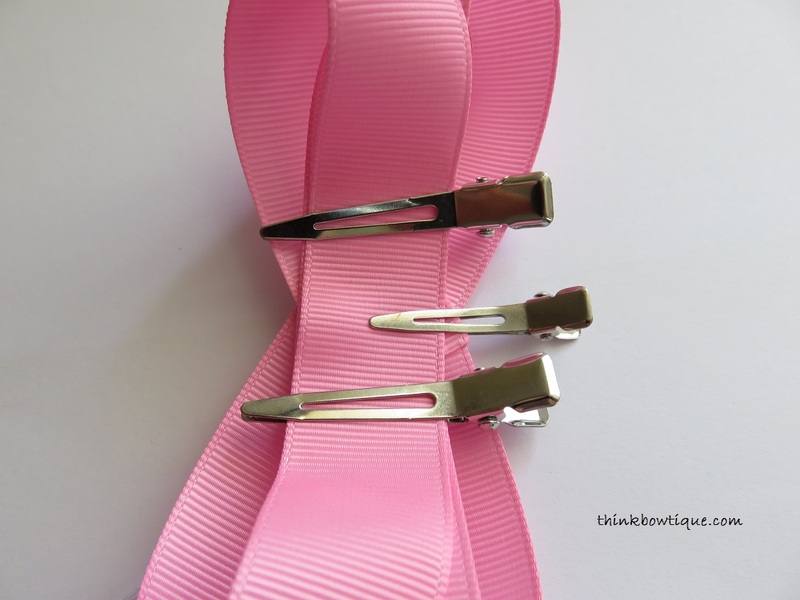 As you push through your lapel pin will slip off. You can skip using the needle. You can just tie it off with your crochet thread. Now tie off your centre. 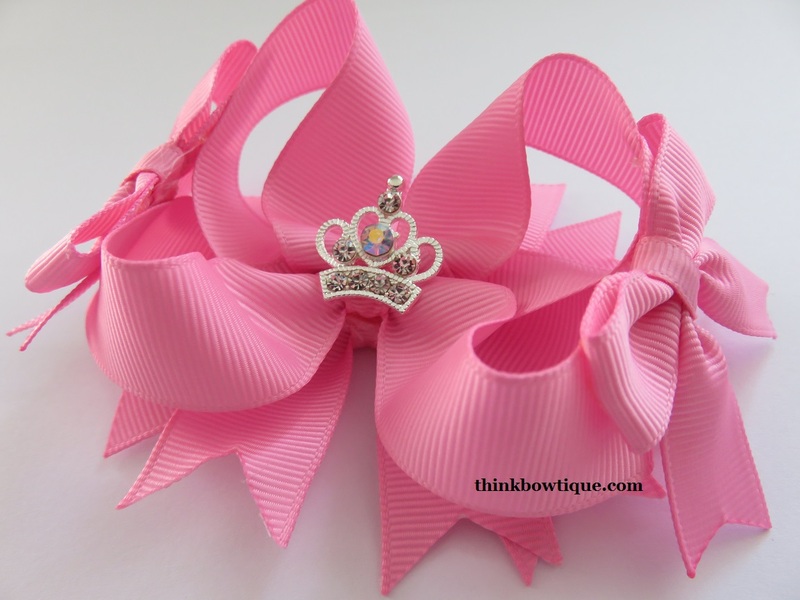 That’s it you now have twisted boutique bow. 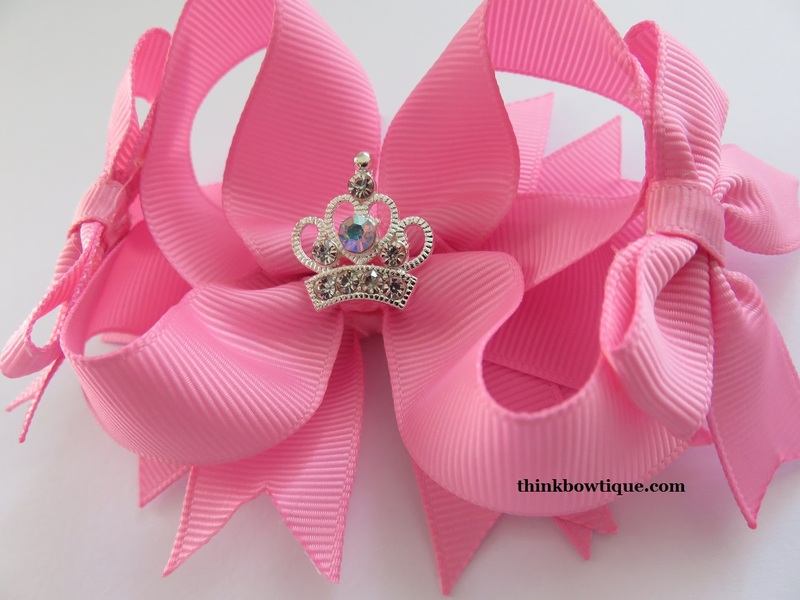 You can finish off your bow with spikes embellish the centre your options are endless. 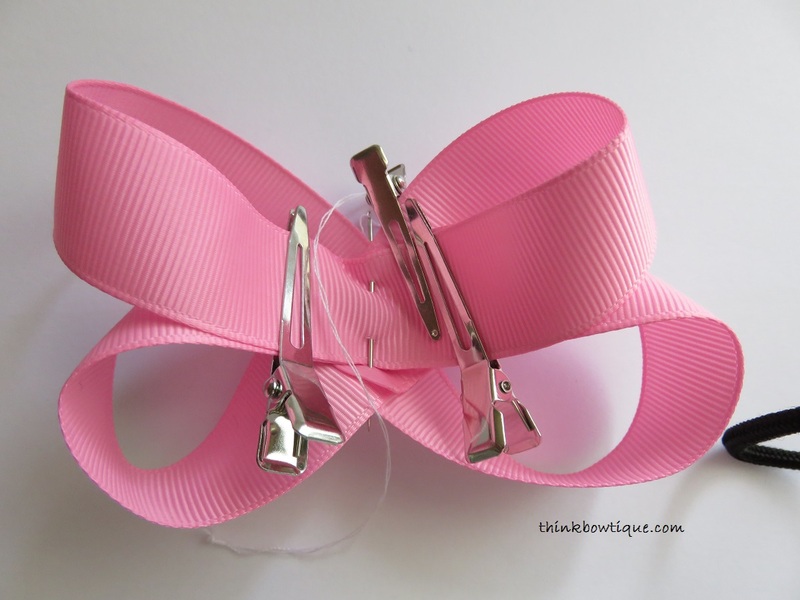 You can find the tutorial on how to make a bow tie hair bow with tails to embellish your bow on another page.